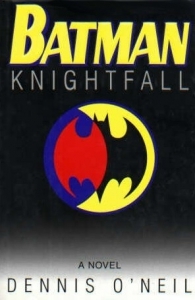 Knightfall written by Dennis O’Neill is a novel, an adaptation of the eponymous comics series about Batman, released in the early 90s. Considered as a classic in the genre of superheroes, Knightfall is the original story of Bane that inspired Christopher Nolan for “The Dark Knight Rises”. At the same time, it poses the question point blank, which is key for Batman, and for the whole universe of DC - what is the limit that a character can not cross while fighting the evil forces. Gotham City is a city of crime and darkness with bright neons and people trying to survive in a place where evil literally oozes from every street. Joker, Two-Face, and the Ventriloquist - these are just some of the fiercest villains that have killed countless innocents. put securely in the madhouse “Arkham” by a single person - Batman - the dark protector of the city, who appears every night in an attempt to protect the innocent. While he is not a ruler of Gotham, he is the man that all of the criminals fear. And so for that reason he becomes a target. Compared to the Dungeon in Santa Prisca, prisons like Black Gate and even Arkham pleasant, cozy places. determined to conquer Gotham by breaking its protector. Confident of his advantage as a fighter, Bane invents a sinister plan with which to drain Batman of his forces, so that the superhero can be broken permanently, forever and irrevocably. It all starts with street-walkers killed for no reason and found on the street and ends with an explosion that will unleash toward the city worst dwellers of Arkham… For the first time in his career as a defender, Bruce Wayne can not cope alone with the situation, and the moment when he will be snapped by Bane is inexorably approaching. an angel of vengeance under the name of Azrael. When all seems lost, he will put on the mask of Batman. But has Bruce had made the right choice in picking him as his substitute? Or has he entrusted Gotham in the hands of a fanatic? The answers to these questions are given in Knightfall, which, according to the recognition of the author Dennis O’Neill himself in the afterword is the most epic story of Batman made up so far. exceptional level that I would compare - although the genre is different - to the adaptation of “Episode III - Revenge of the Sith” written by Matthew Stovar for “Star Wars. ” Unfortunately, from the middle part of the book on it loses some of its focus. I think that the conflict with Azrael is not developed so skillfully as is that of Bane, and the clash between the two to me looks too much cluttered. There are also added some unnecessary storylines that stand in as patches in the storyline, and the finale itself, though cleverly made up, is devoid of the drama of the initial collision with Bane. Overall Knightfall is a strong story about Batman with an excellent idea - but the full potential of this idea is realized many years later by Christopher Nolan with “The Dark Knight Rises”.